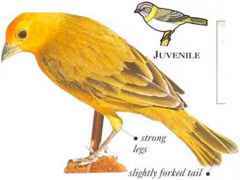 I his scrub and grassland bird is easily identified by the intense yellow plumage of the male, with a darker yellow, almost orange, patch at the front of the crown. Flocks arc commonly seen feeding quietly on the ground, taking small seeds. 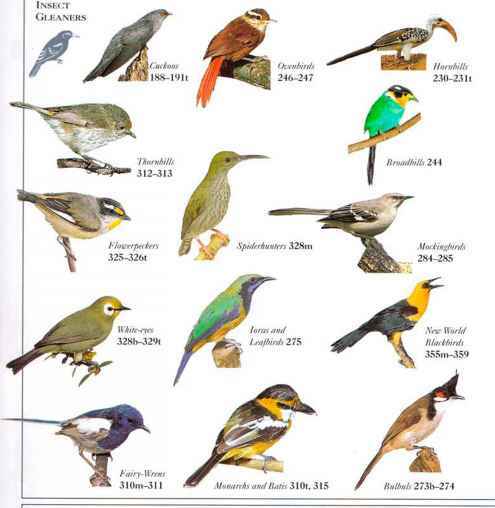 • NEST 111 cavities or abandoned nests of other scrub and grassland birds. • DISTRIBl rriON Scattered areas in South America. Also Trinidad. Introduced in Panama, Jamaica, and Puerto Rico. • REMARK A popular cage bird. This boldly colored little secd-eater inhabits the shrubby edges of areas of open grassland. Flocks are often seen on the ground, feeding on small seeds. The song is soft and pleasant. • NliST A spherical nest made of grass, with a side entrance, situated low in a bush or tree. 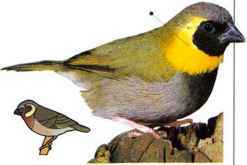 Common within its restricted island range, this unobtrusive but lively little finch feeds both on small seeds and insects. 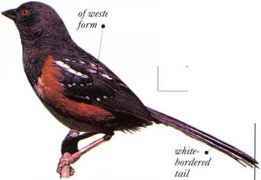 It is the smallest of three species of ground-finch. It sometimes forms mixed flocks together with these and other finches. • NliST A loose cup made of twigs, grasses, and pieces of bark, lined with lichen, feathers and cottonheads, located in a bush or cactus. • Distribution Galapagos islands (off the Pacific coast of Ecuador). A seed-eater with a long tail and short legs, this bird is adapted to a terrestrial life-style. It feeds on the ground, usually in or close to cover, taking both seeds and insects. • NliST An open, loosely made cup nest, situated on or close to the ground. • Distribution s. Canada, usa, and much of Mexico. Northern populations winter in the south of this range.